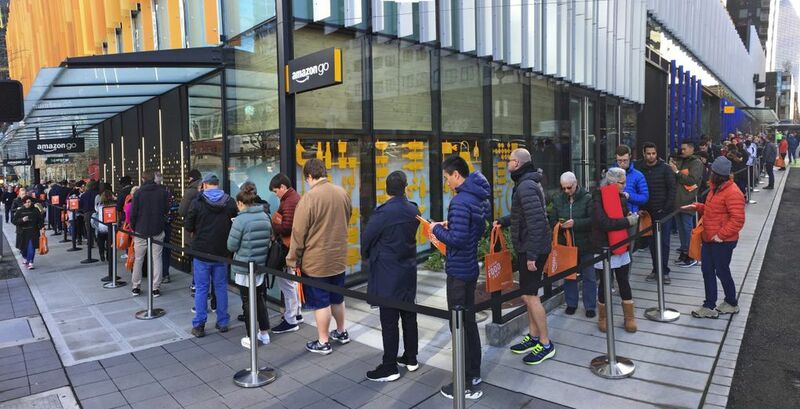 Amazon Go opened to considerable buzz, and long lines at lunchtime, on Monday. How does it work? What if something goes wrong? What about privacy? Read on. 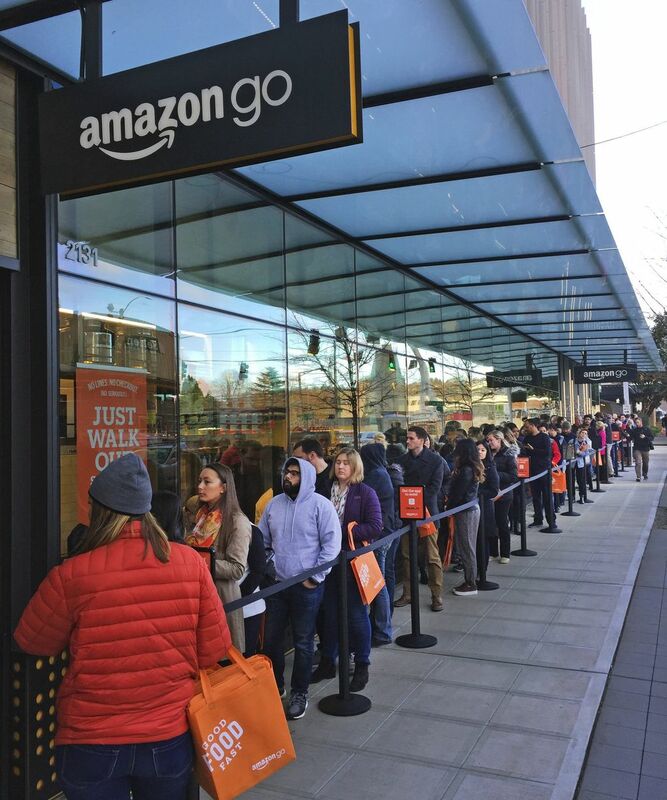 Amazon Go, the retailer’s cashierless convenience store in Seattle, opened to the public Monday morning. We talked to an Amazon executive about the opening and test drove the store. People were curious enough about the absence of checkout lines to brave long entry lines to get into the place during the lunchtime rush. Here are some answers to major questions about the store, which is located in the corner of an Amazon office building at Seventh Avenue and Blanchard Street. Sound off with more questions in the comments below. Before entering, customers have to download the Amazon Go app on a smartphone (available on the Apple iOS and Google Android app stores), open the app, and link it to an Amazon account and a credit or debit card. After that, the app will display a unique code that, when scanned at the store’s subway-turnstile-like gate, grants entry. Starbucks’ cashless cafe stirs up question — shouldn’t retailers have to accept ‘legal tender’? When you exit the store, items you took off the shelf will be charged to the card automatically, and the app will display a receipt for the purchase. In trials of the service on Monday, receipts arrived anywhere from five to 15 minutes after leaving the store. Amazon says little about how it tracks customer purchases, other than that it uses cameras and a variety of sensor inputs. Amazon has video and explainer here. So, I need a smartphone? What if my battery is dead? Amazon says you need the Amazon Go app installed on your phone to use the store. Out of juice? Amazon says employees have mobile chargers on hand. There are also power outlets in a small seating area near the front of the store. Once inside, the system doesn’t need your phone to be powered on to track your purchases. Will I be charged for picking up an item to look at it if I don’t take it out? Nope, as long as you put it back on the shelf, Amazon says its system will automatically take it off your bill. If you’re charged for something you didn’t take, swipe the item on your digital receipt to request a refund. Can I let other people in? Yes. Swipe your smartphone for guests first, and then yourself. Anything they charge will be added to your bill. Can I use food stamps at the store? Video surveillance is common in retail outlets from convenience stores to big-box megastores. But few places would seem to track your movements as precisely as Amazon does as its computer vision algorithms monitor your movements through its store. Does Amazon hold onto data about where you go, what you browse, and your image? Is the place wheelchair friendly? There is a ramp at an entrance, and two wide turnstiles on the left side as you enter the store. Amazon says the store’s employees can help people in wheelchairs navigate the store and grab items.